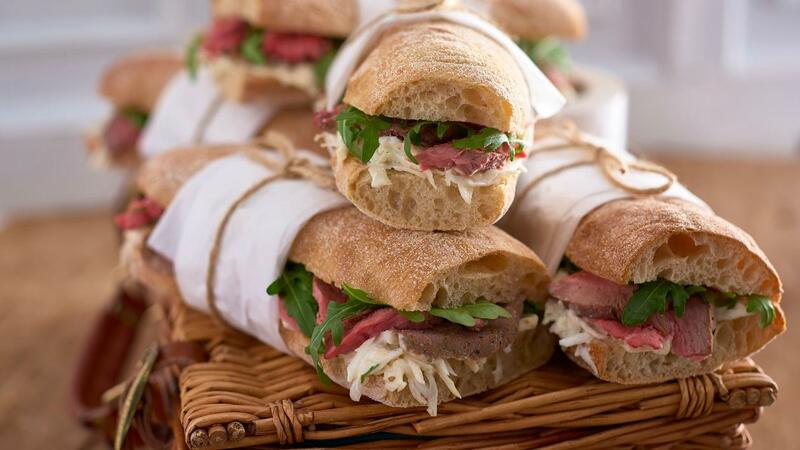 Discover one of our favourite sandwich recipes for chefs! This classic sandwich with celeriac remoulade mixed with mayonnaise and horseradish will certainly become a favourite of your guests too. Wash and dry the rocket leaf. Pick the leaves from the thyme and store in a fridge until required. Place the striploin into a gastronorm tray, cover in the oil and seasoning then place in the oven. Cook for 10 min. then reduce the heat to 180°C. Cook for a further 30 min. or until desired cooking temperature has been reached. Allow to rest and chill before slicing thinly. Store in the fridge until required. Place julienne and celeriac in a mixing bowl. Add the thyme leaves, 200ml HELLMANN'S Real Mayonnaise, COLMAN'S Horseradish and salt to the celeriac and mix together. On the base of each ciabatta place 35g celeriac remoulade, 90g of the cooked beef and 15g of rocket. Spread the remaining 50ml HELLMANN'S Real Mayonnaise on to the top layer.